Baron Munchausen's tales of his extraordinary adventures are legendary: riding cannonballs through the air, sailing to the Moon, meeting gods, escaping from the Turkish army on half a horse, and many others. Can you outdo the Baron? You can try! Challenge your friends to tell the most extraordinary tale, interrupt to correct their boasts, and share your own amazing exploits in this renowned game of wit, riposte, and repartee, written in high style by the Baron himself. Expect no dice, counters, or pencils while playing, just fine wine and great merriment. Time to charge your glass and begin your tale! 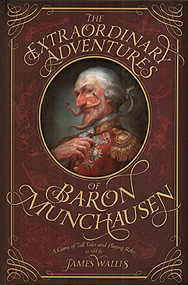 This third edition of The Extraordinary Adventures of Baron Munchausen is massively expanded with new and revised material. Contained within is the original game along with Arabian style rules from Sinbad the Sailor, a simpler version for younger (or inebriated) players, and rules for online games. One of the Baron's own descendants has also added twelve new variants of the game, allowing for stories where villains concoct dastardly schemes, ancient gods return from watery depths, heroic adventurers fight evil empires in outer space, and more!